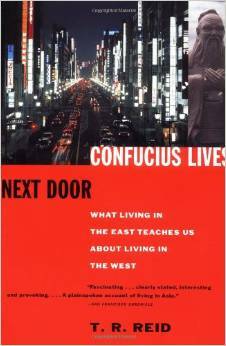 Confucius Lives Next Door: What Living in the East Teaches Us About Living in the West, T.R. Reid, Vintage, 2000, ISBN 978-0679777601, 288pp. Jill picked this paperback up for me during her business trip in the U.S., due in part for her own interest in it, but also because we both had enjoyed T.R. Reid’s informal talks with Bob Edwards on NPR’s Morning Edition where he often provided a great first-hand view of an ex-patriate. Since we’ve been in that position for just a little over 18 months now, she thought I would find Reid’s view of what the East gets right, and gets wrong, interesting. And I did. Reid is clear in his thesis, which may have aged somewhat since the book was written in the late 90s and thus doesn’t cover some of the world changes that have occurred since. The background idea, that Asia is rapidly coming into its own and displacing the 20th century to make the 21st century the Asian century, is hard to refute. Reid’s thesis, however, that this is due to a philosophy born out of Confucian thought, is a little tougher to follow, although he provides plenty of examples, both anecdotal and statistical. The best thing about the book, however, is that Reid adopts a Japanese idea and points out the flaws in his own theory in an afterward (an atogaki). This is where I understood what was bugging me the most about the book, and that is trying to define Asia as a homogenous group. My personal perspective, having lived in Malaysia and visited (albeit too briefly for many of these places) other Asian locations, is that while some shared perspective is present, there’s a lot more cracks in the impenetrable front that is often portrayed within and without the region. Malaysia, in particular, has a schizophrenia from its mixed racial identity and the growth of Islamic economic power. Reid, at one point, quotes a Chinese Malaysian as saying the affirmative action put in place to bring the Malay population out of poverty (in comparison to the Chinese population) was not perfect, but necessary for the culture, might still be said today, but that commentator would also say that it is time to change that affirmative action to one based on income, rather than race, as the ongoing New Economic Plan is increasingly seen as a racial divider rather than one that is actually improving race relations. Finally, the other nice point that Reid emphasizes is that Confucian thought is actually not that far different from Christian teaching, with the golden rule of “Do unto others as you would have others do unto you” expressed as “Do not impose on others what you do not want for yourself.” He then proceeds to make connections between other Judeo-Christian and Classical ethical guidance and Confucius, coming to the conclusion that, in a nutshell, ethics = ethics, in all languages and cultures. The difference may lie in how much individuals are willing to concede to groups, and vice versa (i.e., where are the commons, or where does your face end and my fist begin? ).